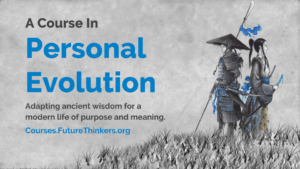 This course seeks to provide philosophies, frameworks, and tools to help you create a life of meaning, purpose, & impact, and gain a feeling of hope, empowerment, and opportunity for the future. Registration is OPEN. The course start date is May 13, 2019. Are you having a crisis of meaning in these disorienting times? Do you feel like you are lacking purpose in your life and your work is having no meaningful impact on the world? Like you do the things that adults do, but you don’t really feel like one? Like the world is falling into chaos around you, and you can’t do anything about it or even make sense of it? Like the things you spend most of your time on don’t give you a deep and lasting sense of fulfillment? Like your potential is being wasted, or like you don’t know what your purpose is? You are not alone, and your situation is not unique. This is a symptom of our times. Most of us were handed a script that simply doesn’t work for our generation: go to school, get good grades, get a career for life, find a partner, get married, have some kids, buy a house in the suburbs, and live happily ever after. Are we all just spoiled jerks? Are we all stupid? Are we all just a generation of inadequate people? If you feel like you can’t seem to find meaning and fulfillment while living in supposedly the most abundant period of human history, you’re not crazy. This is something we have been studying, contemplating, and attempting to remedy in practice for over a decade. Our solution to the meaning crisis was to evolve. To cross the nihilistic abyss and emerge on the other side. Future Thinkers was both the vehicle and the result of our transformation. We now want to help other young people struggling with the same problem, who feel they are lacking meaning, purpose, and impact. This course is the culmination of over a decade of our work in speaking with brilliant thinkers on our podcast, reading hundreds of books, living with different cultures around the world, thinking about the future of humanity, practicing personal transformation, and thousands of hours spent in meditation. It won’t be easy and it won’t be for everyone, but if you can build up the courage in yourself to take a risk, be humble, and learn something new, you may just become the hero of this new narrative that is just beginning to unfold. Last but not least, when you sign up for one of our courses, you get access to the Adapt Video Series. This is our unreleased interview footage from Future Thinkers Podcast where we asked some of our guests the question: What advice would you give to help people be better adapted to today and the future? If you’re ready to take on the challenge to move onto the next step in your personal evolution, register for the course today. 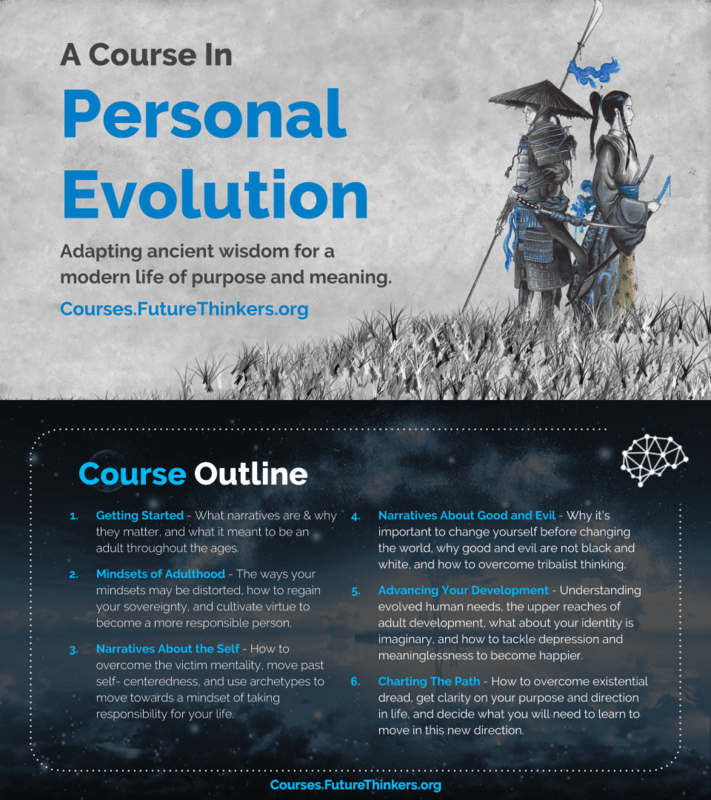 A Course In Personal Evolution is open for registration now! 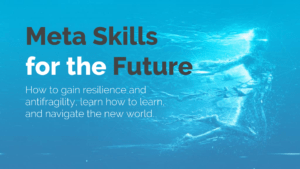 The course start date is May 13, 2019. The first 20 students get $100 off. Enroll now! Take this survey to help us choose the name, art, and tagline for the course.